Luke Conlan in action against Portsmouth. Morecambe boss Jim Bentley believes loanee Luke Conlan is going from strength to strength. The Burnley left back started both the games against Newport and Portsmouth in place of regular starter Laurence Wilson and looks likely to get the nod at Mansfield this weekend. After a shaky start in the defeat against County on Saturday Bentley believes Shrimps fans are starting to see the best of the 21-year-old who impressed against Pompey. 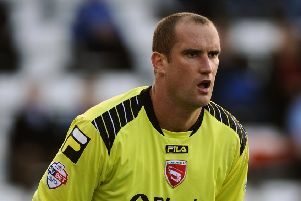 The Shrimps boss said: “He did very well. “He’s come in and it’s always a dilemma whether you throw people straight in. “He’s got to adapt to the way we play, even set plays and things like that and when the timing was right we thought we’d put him in and see what he was all about. “He’s got good pedigree as a Northern Irish Under 21 international and he’s played at Ibrox this season so not much should phase him in that respect. “He had a shaky start against Newport. It was his man who put the ball in the net from the corner and his first couple of passes went astray but he went from strength to strength. Conlan was one of only two signings for the Shrimps during the January transfer window, Manchester United goalkeeper Kieran O’Hara the other, as Bentley looks to make the best of a tight budget. Attention now turns to the emergency loan window which opens on Tuesday but getting players in might be easier said than done. Bentley said: “It’s difficult, we’re not blessed and have had some bad luck this year. “Even back to pre-season when the club budgets for four games and we lose the Blackpool game. “We didn’t have a Saturday game in three months. You look at Portsmouth on Tuesday night who brought 400 fans and that would have been more than a thousand on a Saturday. “The club has and always will be run right. We cut our cloth accordingly. We don’t overspend because the future of the club is the most important thing. “The club have given us a decent budget to get on with. I’d always like to freshen things up but it’s not possible at the moment. With a large number of his squad out of contract in the summer, including the likes of Shaun Miller and Jamie Devitt, perhaps of even more importance is Bentley’s work ahead of next season. He said: “We’ve got quite a few lads out of contract. “We’re getting a little bit of interest in one or two. “We’ve just got to do what we can to secure the futures of the ones we want and try and let the lads know who aren’t going to be here sooner rather than later to help them. “But we can’t leave ourselves short. We’ve got a couple of younger lads we want to push on and get more experience into too.